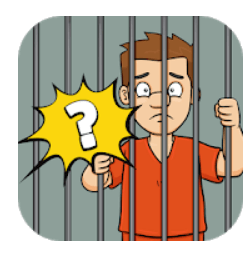 Escape Alcatraz is the new word puzzle game from Great Puzzle Games , the developer of the famous Words story. The concept is the same : resolve the puzzle using all the hints available on the scene, but the design is really better. We have to help Peter, who is innocent from his wife murder, going out from prison in which there are gang members and many dangerous guys. Each scene has a picture and clues, you have to find the hidden word to jump to the next level. [✔] ALL LEVELS are FREE for all users! [✔] Over 200+ word puzzles. [✔] Level difficulty increases as you play. [✔] Game play with no time pressure. [✔] Hint options to help you along the way. [✔] Colorful graphics and exciting gameplay. [✔] Offline word puzzle game.